As 'Murdoch's Scandal' Unravels, Many Implicated Murdoch's Scandal, a new Frontline documentary, examines allegations of phone hacking and bribery that brought down Rupert Murdoch's tabloid News of the World. Criminal and parliamentary investigations are now underway in the U.K., and dozens of journalists and top executives have been arrested. 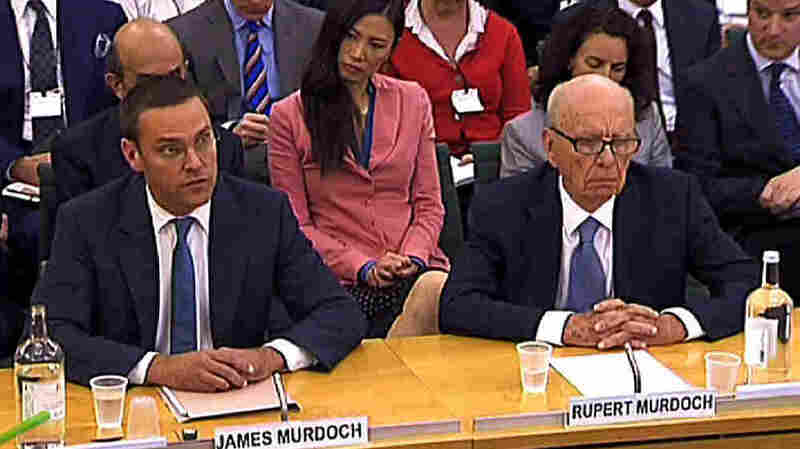 News Corp. CEO Rupert Murdoch, testifying alongside his son James, said his July appearance before a British parliamentary inquiry in London was "the most humble day of my life." Allegations of phone hacking and bribery brought down Rupert Murdoch's tabloid News of the World. Criminal and parliamentary investigations are now under way in the U.K., and dozens of journalists and top executives from Murdoch's paper have been arrested. Scotland Yard has been investigating the scandal, but several police officials from that iconic institution have also been implicated; they're accused of accepting bribes from reporters at Murdoch's papers. Lowell Bergman is a producer and correspondent for the PBS documentary series Frontline. He is also a professor at the Berkeley Graduate School of Journalism. "A number of them went to work for Murdoch's paper afterward — these are higher-level officials — and we don't know what other things went on," says PBS Frontline correspondent Lowell Bergman. "We have plenty of rumors, lots of stories — but for sure, the police themselves have stood up and said that at The Sun, one of Murdoch's papers, there was a 'culture of corruption.'" Murdoch's Scandal, Bergman's Frontline documentary, which airs March 27 on PBS stations, details how the story broke. It also profiles the people who uncovered information about the scandal — and the price they paid for trying to bring it to light. 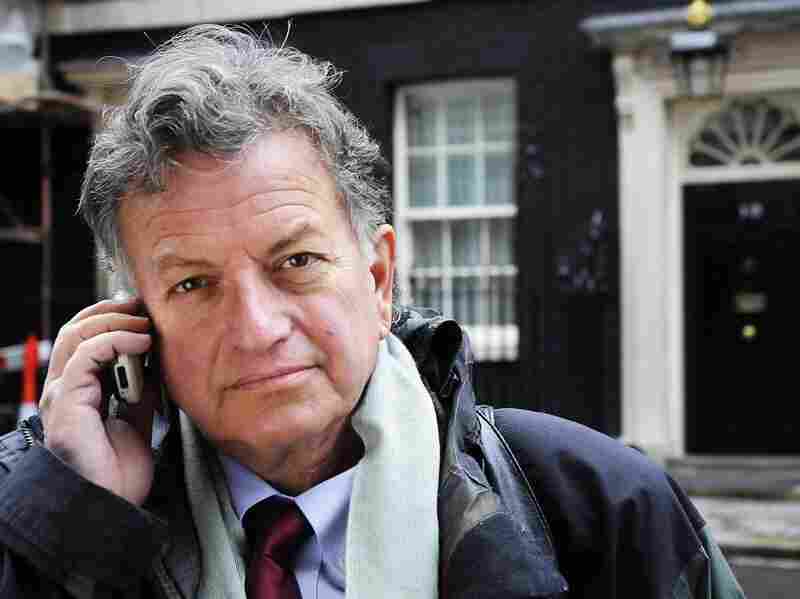 Mark Lewis is the lawyer for more than 80 alleged phone-hacking victims. Labour MPs Tom Watson and Chris Bryant questioned Murdoch and Rebekah Brooks, an executive and former newspaper editor at Murdoch's News International umbrella corporation, during parliamentary hearings. And Nick Davies is the reporter for The Guardian, the paper that originally broke the phone-hacking story. Some of them were put under surveillance by private investigators hired by News International. Others were intimidated, says Bergman, through a process called "monstering," in which Murdoch's papers singled out individuals and attacked their character on a daily basis. The Bottom Line: Murdoch's Influence In The U.K.
"[Chris Bryant] tells the story that at some time [after questioning Brooks in Parliament in 2003] he runs into her at a party, and she starts to say unkind things to him, that she knows that he's gay," says Bergman. "Then soon after, he gets 'monstered' by the tabloids, where they single out an individual and go after him day after day. "They began to show pictures of him in his underwear — any pictures they could find of him being somewhat compromising — talking about him being a member of Parliament, being gay, etc. And leaning on him, and, he thought for a while, endangering his political career." Bryant was reelected and is still pursuing the investigation, says Bergman. "I think the most important part of all of this was that there was no police investigation after a public admission [by Brooks in 2003] that '[The paper] pays the police.' We know from News Corporation, and its answers to various questions back in New York, they did not launch any investigation to find out what was going on inside. And when we asked a veteran editor about it — about whether or not he knew that his paper paid the police — he said no one ever told him." Public statements given by Scotland Yard indicate that people inside the metropolitan police were being paid off, some of them in excess of six figures, says Bergman. "They said there was a culture of corruption inside the paper," he says. A former reporter for one of Murdoch's tabloids told Bergman that journalists at The Sun and News of the World were pressured to file big stories multiple times a year, leading to a culture where rules were broken. "But it's our understanding, both from the public record and testimony that's taken place in a public inquiry, that bribery by the Murdoch tabloids was endemic for decades," says Bergman. "This was not a practice that emerged in the early 1990s, especially as it relates to the police." Bergman says he's not shocked that people were paying off the police — or that the police were accepting bribes from journalists. "What shocked me was how this was all a very small group of people who were all playing in the same game in London, and the scale of it — the intimacy of it, how close they were — and the fact that Parliament didn't have the power or will to get to the bottom of it," he says. "And that it was, in the end, a Manchester lawyer, a reporter for The Guardian, and a few members of Parliament that allowed this to come out." "It was pretty widespread practice in various news organizations, not only to pay for information, but to use private investigators. On the surface, using private investigators is done. It's done in this country as well. But you stay within certain rules. You keep people, if you will, on a narrow focus about what they can do and what they can't do when you hire people on the outside. But in Britain apparently and in the heat of the tabloid industry there, many people say fueled by Murdoch, ... this became standard practice." "He and a woman who he was going out with and worked with were put under surveillance, as was his ex-wife and child by a private investigator hired by News International. It isn't that they just go out and hire private investigators. We now know that some of these private investigators worked in the newsroom. Or were told, 'Become journalists. Join the journalism union.' They were integrating these investigators into their newsroom operations. These surveillances were ordered. In fact, James Murdoch has now publicly apologized to Mr. Lewis and Tom Watson, a member of Parliament, for putting them under surveillance." "I was working at The New York Times during the Jayson Blair episode. At The New York Times, the paper officially went on an obsession of telling the audience everything it knew about what had gone on inside The New York Times, to get honest with its readers and with its audience. This is the News Corporation, that's its title. It does own some real legitimate news organizations, like The Wall Street Journal. It owns a television news operation on cable that seems unfettered in what it is willing to talk about — over the top, sometimes. I think it is even proud of that. And it owns reputable newspapers in Britain, as well as these tabloids — and no one will talk? Across the board, silence. I even went to the extent of writing letters — personal letters — to two dozen people inside the organization after trying to talk to people on the phone, and the only response was a letter from Rupert Murdoch himself. It was a very short note, saying he was unable to talk about this at this time. Everyone else has been silent except for The Wall Street Journal's editorial page, and I've tried them as well. They've written editorials about it, complaining about some of the coverage."